Printed stamp albums come in many different types and cater to beginners and experienced collectors alike- from general collectors to topical collectors. Printed albums include many, which are especially intended to present spaces for just one kind of stamp or for the postage stamps of one country. So, you could acquire a printed album that will present spaces for airmail stamps only, for Roosevelt Stamps, or for some kind of special selection of postage stamps, such as the Famous American Series from the United States, the UN stamps, Vatican City postage stamps, and so on. Once the subject the stamp album is designed for is complete and nothing more is ever going to be added to it, the loose-leaf aspect is not required or so desirable. There are many of such specific stamp albums that cover a wide variety of purposes. For instance, you can get albums that offer places for blocks of four USA commemorative postage stamps or other stamp albums that provide for plate number blocks of the same. 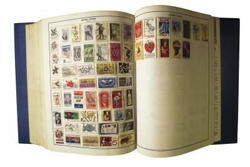 Indeed, you may acquire a printed stamp album to suit just about any purpose you are interested in. Still, other albums in this group would be those that offer spaces for the stamps of merely one nation or group of countries. Such stamp albums cover the planet starting with volumes for US Postage stamps exclusively, for postage stamps of the British Empire, for Postage stamps of France and Colonies, Germany and Colonies, and so on. Generally, these "specialized" stamp albums are printed on one side of the page only, and they are in every way the very best and most "adult" printed albums offered. They range in price from around a few dollars for the smallest group of stamps up to about 10s of dollars or more for the largest groups of postage stamps.